Clare Halifax's printmaking contrasts extraordinary detail with wide open space and scale combined with abstract pattern. She is an observer of urban environments that teem with buildings, life and activity, often taking in large vistas or aerial views. 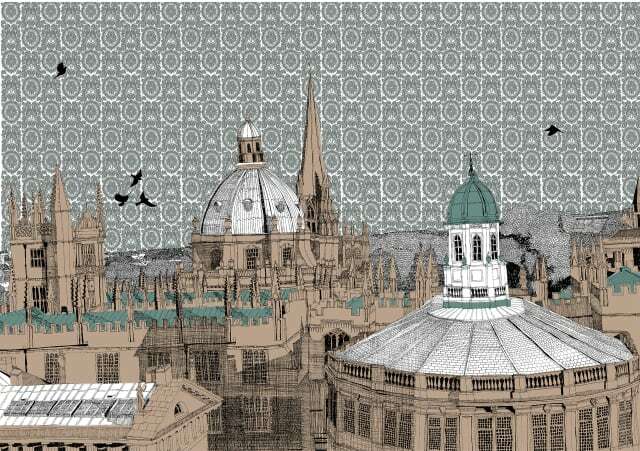 Her series of Oxford prints explore the famous spires and rooftops that characterise the city, as well as its large open green spaces. Clare Halifax studied printed textiles at Loughborough University, graduating in 2000. She went on to sell her designs to the international fashion and interior markets. Taking a career diversion, she returned to art school in Bristol, gaining an MA in Multi-disciplinary printmaking, specialising in silk-screen prints. Since then, she has continued to create and exhibit her printmaking around the UK, as well as working on collaborations with Farrow and Ball, John Lewis, The London Print Club as well as The Victoria and Albert Museum. She has also worked with Bern helmets, the trendy London-based cycle helmet designers, creating a London-inspired helmet featuring her artwork.